DPCI developed a Photo Rights Application for Simon &amp; Schuster that provides access to digital rights by embedding a unique art ID number into the XMP data of graphics files. Simon & Schuster retained DPCI to create an application to allow users to embed a Simon & Schuster ID number into the XMP data of graphic files. This embedded ID number allows Simon & Schuster to track and manage the digital rights for each asset. DPCI developed an application, written in Java, as a standalone Macintosh and Windows desktop application that supports various digital files that contain an XMP packet. 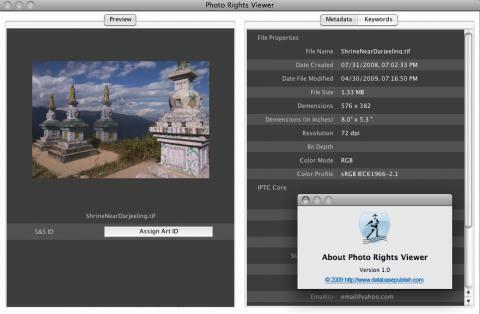 When a digital asset is opened in DPCI's Photo Rights application, the application displays the file's XMP data to the user, providing view-only access along with a thumbnail representation of that file. With the click of a button, the application sends the XMP data to the Simon & Schuster .NET-based digital rights database via a Web Service and in return receives a unique art ID. Once the unique ID is associated with the asset, or if a unique ID is already present, the user can provide or view the digital rights for the asset. From within the application, the user clicks a button which opens a Web page from the digital rights database, allowing the user to edit the data for that graphic based on its unique Art ID. From there, the user will fill out a Web form to describe the rights owned, create a purchase order, link it to an existing purchase order and more. The user can then continue to use the application to process more graphics. This small application allows Simon & Schuster employees to easily determine if they can use a particular image, or what the limitations are for using that image in a project.